I love this idea. I have so many scraps along with rolls of vintage trims. I like looking at the trims in a big plastic jug. But now I can do something with them. They can take the place of the suggested ribbon. The randomness of this activity appeals to me greatly. I think my saved fabric selvedge lengths will be fun to use for this, too, maybe sewn on torn lengths of fabrics. I can’t think of a better way to spend some of these odd rainy days we’re having here in Colorado. Feels like I never left NYC. Thx a million for sharing this idea! Very inspiring post, as always! I hate throwing out bits of yarn, cloth..you name it, I keep it. I think I’ll try the above with my fabric scraps! Thanks so much for the idea! I agree, it is addictive, I’ve been doing it with cotton scraps after first reading about over at THE LINEN GARDEN. I’m going to try it using all my lacy bits now after seeing your fabulous results. Lovely idea. I have a hard time throwing away scraps too. I am in the process of making a blue jean quilt and have a big stash of each blue jean that I cut up. Waist band, zipper and all seams still attached in one piece. I have been trying to think of something to do with them other than throwing away. I would like to hear about any ideas. 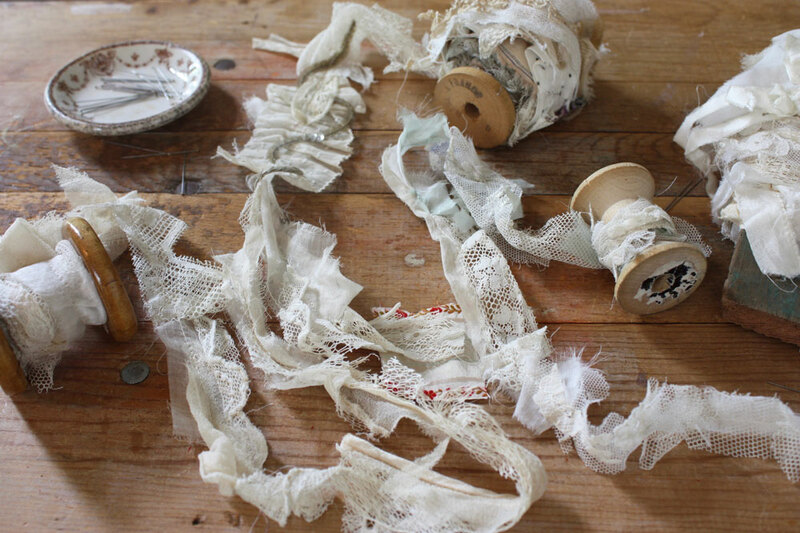 I also have loads of scraps of beautiful lace and love this idea on how to use them. Thank you Ann, you always come up with so many interesting posts, I do so look forward to receiving your emails. “little whispers I cannot let go of” – OMGOsh. I’m so totally there. Dreamy! !